OSHA and the National Institute of Occupational Safety and Health (NIOSH) released a new toolkit on May 15th 2015. It intends to help protect health care workers from contagious diseases and other respiratory hazards. The Hospital Respiratory Protection Program Toolkit addresses respirator use, public health guidance on using respirators during exposure to infectious diseases, and hazardous duties. It also provides links to additional resources, including templates and educational materials. 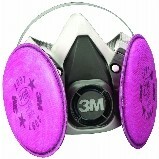 OSHA’s Respiratory Protection Standard mandates that employers implement and sustain a respiratory protection program in environments where workers might be exposed to airborne hazards. Global Environmental Network, Inc. is pleased to offer a July Special: 10% off of our Fit Testing, Training or Program Development*! Need all 3, call for our specials!Offer cannot be used with any additional discounts, promotions or competitive bids.Buy now, so you don’t miss this great opportunity! *Pricing is discounted off of our list price.